March 1 Big 50 5:30 P.M.
March 3 Singles Marathon 10:30 A.M.
March 8 Big 50 5:30 P.M.
March 10 100 Bird Event Singles, Handicap, Doubles 10:30 A.M.
March 15 Big 50 5:30 P.M.
March 17 Handicap Marathon 10:30 A.M.
March 22 Big 50 5:30 P.M.
March 24 Doubles Marathon 10:30 A.M.
March 29 Big 50 5:30 P.M.
March 31 Singles Marathon 10:30 A.M.
April 5 Big 50 5:30 P.M.
April 7 Handicap Marathon 10:30 A.M.
April 12 Big 50 5:30 P.M.
April 14 100 Bird Event Singles, Handicap, Doubles 10:30 A.M.
April 19 Big 50 5:30 P.M.
April 21 Doubles Marathon 10:30 A.M.
April 26 Big 50 5:30 P.M.
April 28 100 Bird Event Singles, Handicap, Doubles 10:30 A.M.
May 3 Big 50 5:30 P.M.
May 10 Big 50 5:30 P.M.
May 12 100 Bird Event Singles, Handicap, Doubles 10:30 A.M.
May 17 Big 50 5:30 P.M.
May 24 Big 50 5:30 P.M.
May 26 100 Bird Event Singles, Handicap, Doubles 10:30 A.M.
June 7 Big 50 5:30 P.M.
June 16 100 Bird Event Singles, Handicap, Doubles 10:30 A.M.
June 28 Big 50 5:30 P.M.
July 5 Big 50 5:30 P.M.
July 7 100 Bird Event Singles, Handicap, Doubles 10:30 A.M.
July 19 Big 50 5:30 P.M.
July 28 100 Bird Event Singles, Handicap, Doubles 10:30 A.M.
August 2 Big 50 5:30 P.M.
August 11 100 Bird Event Singles, Handicap, Doubles 10:30 A.M.
August 23 Big 50 5:30 P.M.
September 6 Big 50 5:30 P.M.
September 15 100 Bird Event Singles, Handicap, Doubles 10:30 A.M.
September 20 Big 50 5:30 P.M.
September 29 100 Bird Event Singles, Handicap, Doubles 10:30 A.M.
October 4 Big 50 5:30 P.M.
October 13 100 Bird Event singles, Handicap, Doubles 10:30 A.M.
October 18 Big 50 5:30 P.M.
October 27 100 Bird Event singles, Handicap, Doubles 10:30 A.M. Boundaries: From New Martinsville Dam south to Willow Island Dam and anywhere in Middle Island Creek. All fishermen must comply with all Federal and State fishing regulations. Any legal natural or artificial bait will be allowed. Catfish must be at least 14” long to be weighed. In case of a tie the team/person with the longest measured fish will be declared the winner. No late weigh-ins will be allowed! Late arrivals will be disqualified, no exceptions! $20 per team entry fee. Individuals may enter for $10. 12 years old and under $5. Fish must be alive to be weighed, no dead fish will be weighed. Fish will be released after weigh-in. Arguing or fighting will not be tolerated. Pay out for winners will be 1st place – 60%. 2nd place – 30%. 3rd place – 10%. A maximum of four fish will be weighed. Additional smallest and biggest fish purses may be entered for $5 each and will paid out in full. Registration will begin at 6:30 p.m. at Tyler Rod and Gun Club. Club is 5.5 miles from Route 2 in Friendly. Located at Little, WV near Hissam’s Cabins. Tournament will run from 8:00 p.m. to 8:00 a.m. 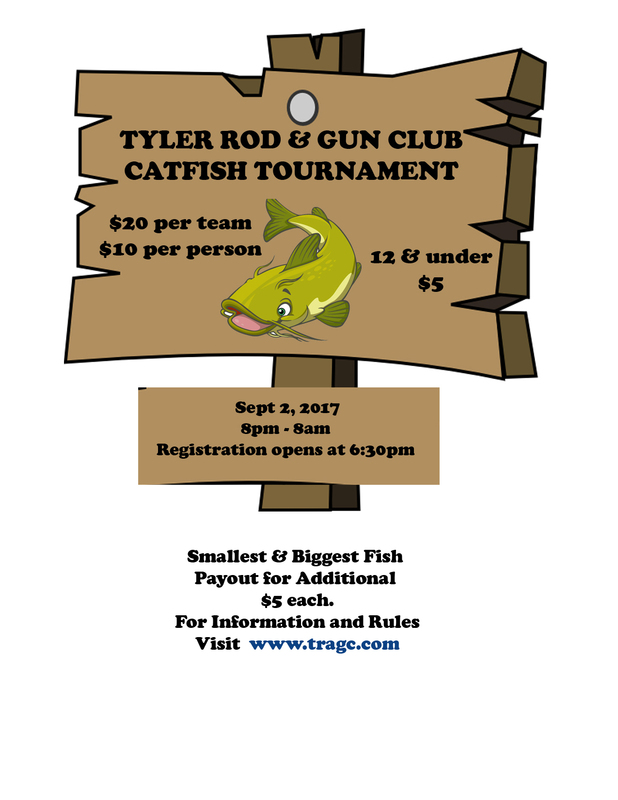 Fish must be weighed in before 9:00 a.m.
For information on the Tyler Rod & Gun Club or the Catfish Tournament, you can email us at trgc2016@gmail.com or visit our FaceBook page at www.facebook.com/tylerrodandgunclub/ . Buddy Shoots, Annie’s, Protectors, Calcutta, etc. Paper Shotgun shoot begins before the Buddy Shoots at Noon. The Tyler Rod & Gun Club will be hosting a high powered rifle shoot Saturday, November 11 at 11:00 am. We would also like to thank Mr. Allen Hunt, Owner of A&A Supply, LLC. for donating materials for our new shooting benches.